Sometimes, when you go to the Farmer’s Market, an ethnic grocery store, or an organic store, you buy something really unusual, whether because it interested you, morbid curiosity, or just ‘cause. 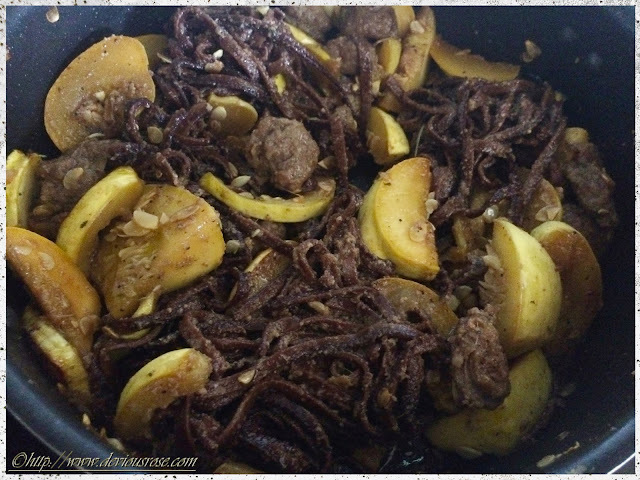 This post is borne of such a buy: chocolate linguine from a pasta stall I’ve purchased before. I have been interested in the chocolate pasta since I “discovered” a woman selling Pappardelle’s pasta back in March. I bought this chocolate linguini two Sundays ago, but since March I have purchased portobello mushroom pasta, four peppercorn, sundried tomato linguini, and lemon parsley. None of these have disappointed me, and in all of these pastas, the flavour just POPS. I mean, that mushroom pasta tasted like pure mushrooms, and I, a person who is not fond of plain pasta, wanted to eat it all by itself! Sliced squash. Sorry for no whole photo- but just make it a mission to find an unusual squash! I took all the photos on my phone (sorry!) and did not photograph the squash before slicing. 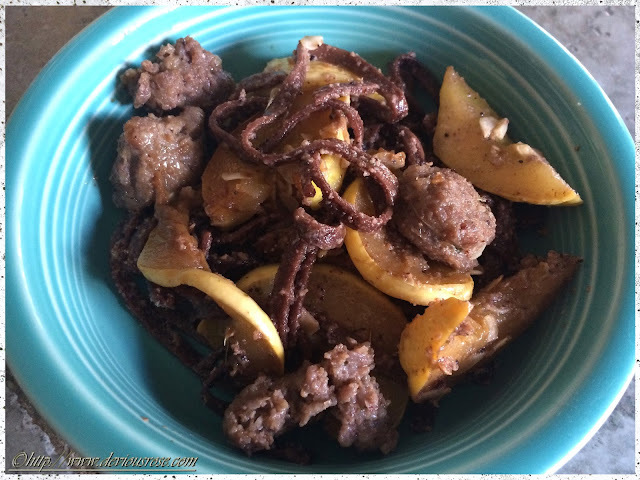 So, for this recipe, make it your mission to find unusual squash and pasta, or use it as a starting point for your own ideas! Chocolate in food wasn't that strange to me, being Mexican, and being from a family that loves cooking, I know how to handle a challenge. For this meal, I was unsure how the pasta would taste, but I knew that squash would go well whether I went for savoury, sweet, or any other flavour, and the weird squash pile in the farmer's market caught my eye. I cooked the pasta first to decide how I would make it, and decided that the pure cacao flavour would be muted or even killed if I made the creamy sauce I had been planning on. I still wanted simple, so I went for a fresh little pesto with squash, and some pecans to complement the pasta. I left the pesto more textured than most I've seen, to keep some of the original flavour of the components. I would totally buy this pasta and this squash again. This dish would be a perfect side to some pork roasted with white wine vinegar, or other simply cooked but still decadent fare. I would also like to taste it with slices of brie, added in the last 5 minutes of cooking. I thought of adding parmesan, but the strong flavour would overtake the subtleties of the squash and chocolate. My short time in France last year did teach me that- pungent and flavourful is not the only way! "Simple" flavours go a long way indeed. 2 medium squash, sliced thickly, of any variety! I didn’t get the name of the squash I used, I just picked two because they looked interesting. You could use 1 butternut squash or a medium-sized yellow pumpkin if your options are limited. *I got mine from the farmer’s market. The company was Pappardelle’s and they are available at some localities throughout the USA, usually at farmer’s markets and local festivals. In a large pan, melt butter to just past melted, add in the minced garlic, and cook on medium until golden. 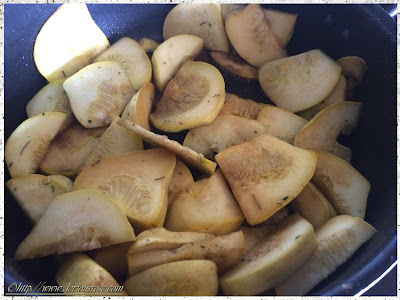 Add in sliced squash, sprinkle with rosemary, and cook on medium for about 4 minutes. After 4 minutes, stir and add in the balsamic vinegar, followed immediately by the sliced sausage. Sprinkle with pepper and salt, stir, and allow to cook covered on medium until sausage is just done, stirring occasionally. Uncover and raise heat slightly, and cook until squash begins to blacken. While the squash and sausage are cooking, place all ingredients for the pesto in a food processor and blend until mostly smooth, but still a little textured. Heat some olive oil in a pan, and once hot, pour the pesto over so that it sizzles. 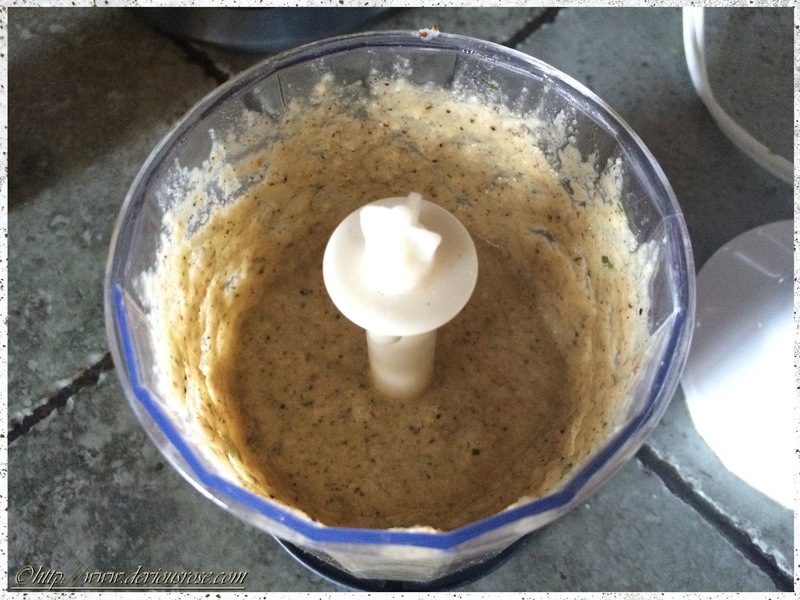 Cook the pesto on medium heat until it changes colour, adding splashes of olive oil if it starts to get too dry. Add pasta and stir well, until evenly coated. Cook 5 minutes on medium-high heat, uncovered and stirring often. Serve pasta and squash-sausage dish either apart with a salad or yummy bread, or mix the squash and sausage with the pasta and serve together as a side to a main dish. 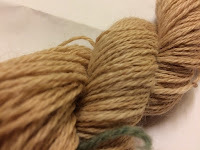 The same skein, dyed with pecan shells, under 2 different light sources, artificial and natural. Both are accurate- the vibrancy dye from pecan shells is very sensitive to light, but thus far the skein has NOT faded in any way. Okay, so I had a previous post about natural dyeing, about lemongrass. I had also written one earlier this year about pecan shells, but the mobile app lost it all and I couldn't be bothered to retype it all. Which is really a shame, because it also held my thoughts about having just gotten into spinning a couple weeks prior, and I wanted that to reflect on. So again, here we go; dyeing with pecan shells. SHELLS. Not the husks, as you may have seen on natural dye lists. When I did this, I could find nothing on dyeing with pecan shells, anywhere. The one reference to it I found online was someone saying that you dye with pecan husks, not pecan shells, and that the shells should be expected to have no colour. But I know nature holds numerous surprises, and that chemistry of pigmentation, like all chemistry, is complicated. So I ignored that post, and set pecan shells to boil, expecting a clear brown colour but knowing that there night be a surprise. And there was. I got a strong, somewhat clear pinkish brown, or dusky rose. 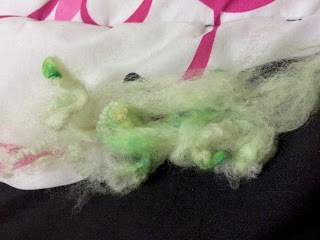 And I dyed superwash combed top with it, and it was beautiful. Today, I did not dye with pecan shells, but I did extract the dye from them to make sure that first time had not been a fluke. But anyway, if you want to know my process for dyeing with pecan shells, it's pretty straightforward and works like any acid dyeing process for protein fibers such as wool and alpaca. If you already have a good dye process, extracting the dye from toasted pecan shells is in steps 2a and 2b. If you are still exploring, feel free to read the whole tutorial and use what works for you! 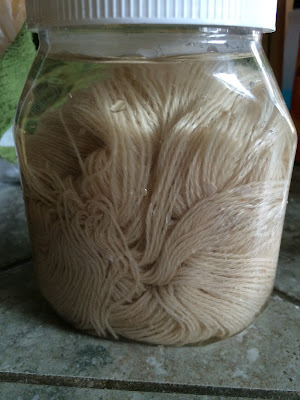 Dye Process/Tips: 1) I let my yarn soak in vinegar overnight. Not too much and not measured, just what is maybe about 1/4 cup/6 cL of vinegar in a little tub of maybe a liter and a half of water? Whatever your usual acid concentration is. I let this soak overnight, because I usually do cold dyeing, and even if I don't I've just found that it helps colourfastness. BUT, that's because when I don't cold dye it's because I get impatient with my cold dyeing process and hot dye midway through it. 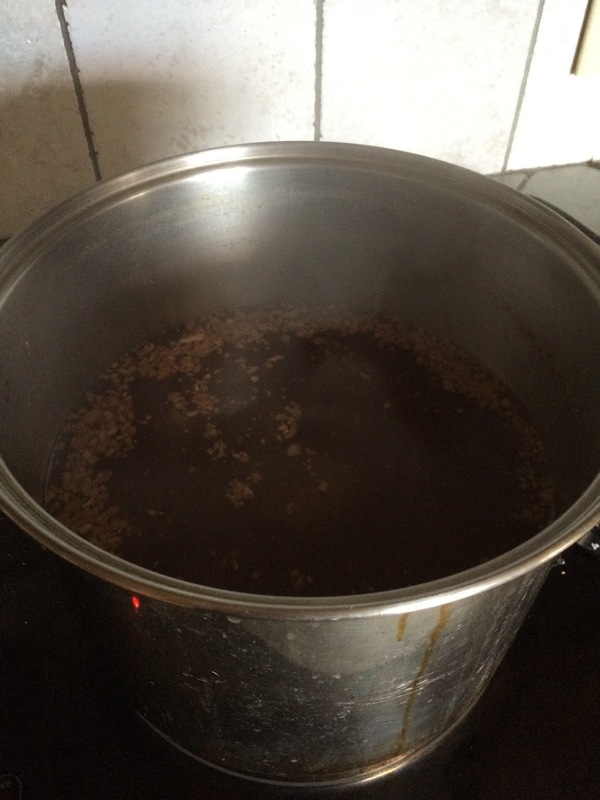 2a) I extract the dye from the pecan shells with just a handful put into boiling water- the colour is very strong! It's surprising, but you only need a small handful in a large pot to get a deep, intense colour. My hands are tiny, and I've got 2 large pickle jars of dye stock solution now thanks to the pigment's intensity. February's dye pot of pecan shells. Today's was much smaller. 2b) Double, double toil and trouble, fire burn, and cauldron bubble! Basically, boil for a good long while- I do about 30 minutes, then simmer on low for 15 more. Some people simmer longer to get all the pigments leached out into solution, some let the dye stock soak overnight for the same purpose. I do the soak overnight. I have stored the solutions both in a dark, cool drawer and in the refrigerator. I do not know how long they can last in a cupboard, as the longest time I have kept dye stock solution tucked away without refrigeration is a month in winter. 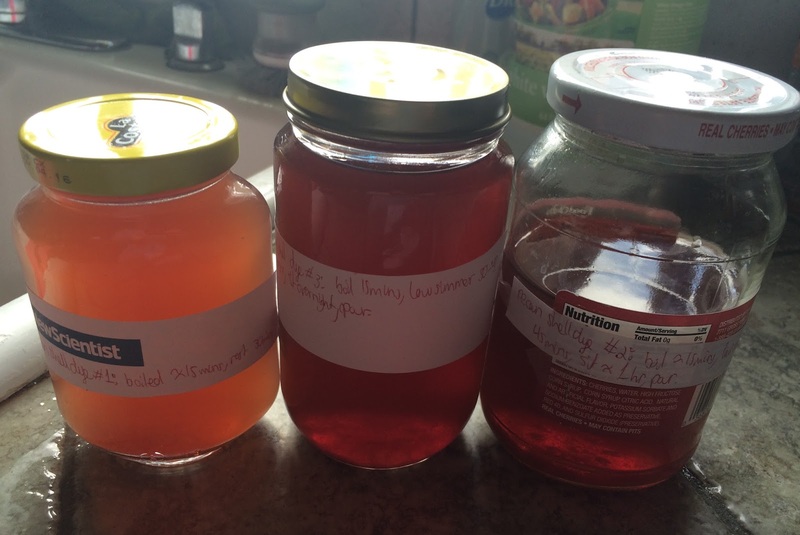 3 extractions of pecan dye stock solution- told you it had a strong colour! Left: No overnight soak, just boil 15 minutes and rest 30 minutes in the pot. Middle: Boil 15 minutes, let simmer and 30-45 minutes, sit overnight, pour. Left: Boil 15 minutes, let simmer 45 minutes, sit 1 hour, pour into jar. 3) To dye your fiber, plunge into a solution of the dye solution plus, if you need it, water- make the dye stronger than the colour you want in your yarn. 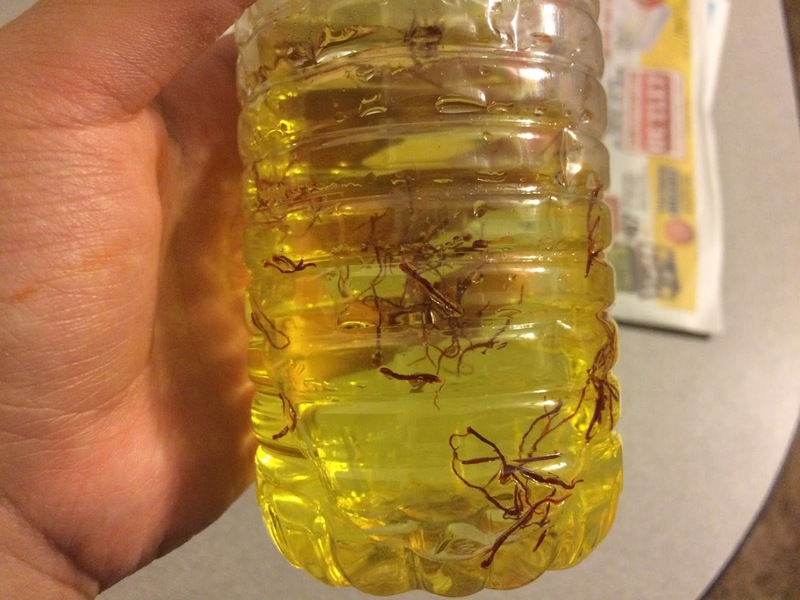 I usually pour my vinegar soak solution into my dye solution. Make sure the solution is THE SAME TEMPERATURE as your vinegar soak is, unless you are using superwash or a yarn from a breed like Suffolk. Even then I'd not shock the yarn. If it is fiber, be extra gentle with it when you push it and squish it down to get totally soaked. 4) If you hot dye, perform your usual temperature process here. If you haven't hot dyed before but want to, up the temperature slowly to just boiling and letting your yarn simmer for about an hour, then turn off the stove but leave over heat. If using the microwave, let it sit there for an hour or so. If you want to cold dye like me, I heat up the solution to just warm, then I cover and let my yarn or fiber sit there overnight. 5) After the dye soak, rinse your yarn or fiber until the water runs clear. For fiber, I put it in a large strainer and gentle run water over it indirectly, not directly. I just let the water run over my hand and sprinkle it over my fiber, squeezing gently. To quote Natalie Redding of Namaste Farms, what makes wools felt is detergent+temperature change+agitation. Don't use soap yet, don't shock your fiber, and you may squeeze gentle so long as you don't manhandle it. I swirl it, squeeze it, pull it, etc., but carefully. 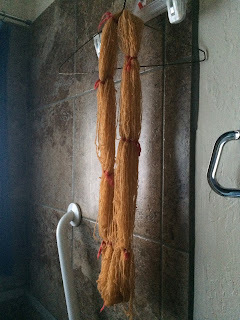 6) Once water runs clear, you can add your soap and rinse your yarn or fiber. Remember to keep the water temperature constant, or to let it change steadily to prevent felting. This step will make sure that there are no leftover smellsies on your precious hand-dyed yarn or fiber. 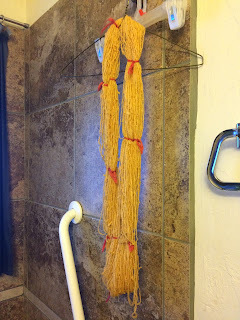 7) Hang your yarn or fiber up to dry. Superwash merino fiber dyed with pecans, and the (newbie) yarn spun from it. I splashed on food colouring at assorted points in the 75 grams of top. It spread and the pecan-only parts looked like they had disappeared, but upon spinning I was delighted to find that the food colouring did not penetrate all the way, and the finished yarn is mostly that pinkish brown tone from the pecan shells, with some spots of colour throughout. Disclaimer: Remember, this is just how I dye with pecans. You should find the process that works best for you, then extrapolate the portions you need from other people's tutorials, such as how to get the pecan shell dye out in mine, if you already have a dyeing process. So long as your final product taught you something and/or is useable, no dye job is a failure! This one is easier. 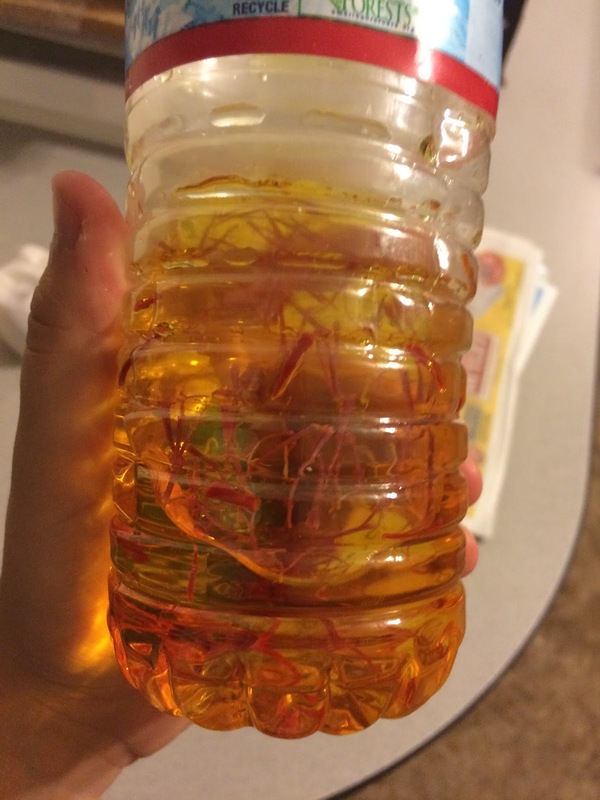 I happened upon some old, spilled saffron in our spice cabinet, and decided to use it. I also happened upon http://www.reconstructinghistory.com/articles/irish-articles/dyeing-with-real-saffron.html, which told me that if I see somewhere that saffron is a fugitive dye, then the author was likely confusing saffron with safflower. Same skein of yarn, different light sources. The left is almost no light, the right is natural + artificial light. In most lights it looks like the right. It's very weird, but I like the effect. So, I accidentally missed the last Challenge Day of this Tour de Fleece because I wasn't paying too much attention to the schedule other than start and end dates. This is also the first time I have participated, and I only heard of this a couple months ago since I just got into spinning this January, so I didn't know the structure. I also actually adhered to the rest day on Tuesday, which was absolutely marvellous for my wrists, which are no longer aching constantly. 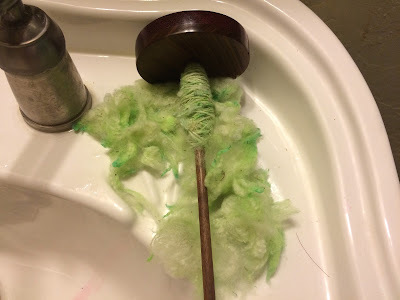 Anyway, my original challenge for the Challenge Day was to ply my Suffolk on my new The Dancing Goats supported spindle, which was somewhat cheating because I have plied on my other The Dancing Goats spindle, but it was my Navajo Churro fleece that I blogged about before. Now that I think about it, it's actually quite fitting that the fleece I bought at the same time as the Navajo Churro also be plied on the same sort of spindle from the same maker. And what a lovely surprise. I hate plying, especially because my drop spindle gets sooo heavy, and plying Mirkwood was a huge factor in the week of wrist pain, so I had decided then and there that I would ply my next thing on a supported spindle. 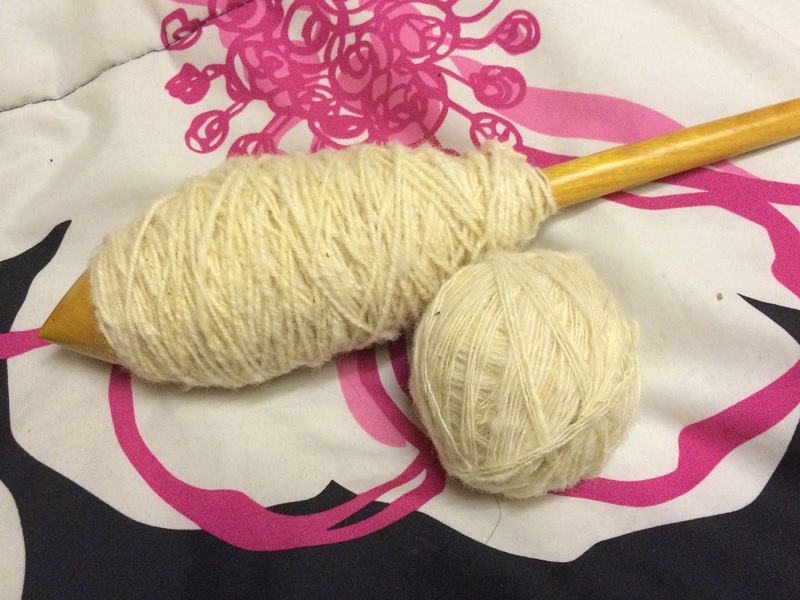 But today, the plying was wonderfully painless, my wrists didn't snap or crack or ache at any point, and I was able to just put a notebook on the floor and stretch very little to flick the tip every now and then, wind on when there was enough twist, and repeat. I want a very bouncy yarn, so I am plying to what looks just a tad bit overplied to me, then winding on. It is remarkably even, and I can't wait to get to dyeing it. Some of the Rambouillet locks I dyed and spun for this challenge day, from different section of the fleece, and under different light sources to give a good idea of colour variation. The second challenge I did came to me on the spur of the moment. I had grabbed a couple handfuls of locks from my mass of Rambouillet fleece, and dyed them with some food colouring and espresso from used coffee beans, using vinegar as a mordant. 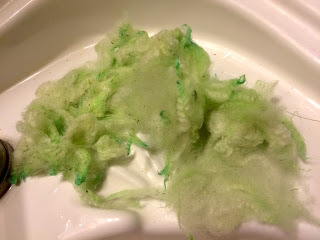 I did a cold dye as I usually do, after scouring my fleece to get out ALL the lanolin (I got most of the lanolin out in my initial wash and have been spinning in the grease). I skimped out on the vinegar soak, leaving it only an hour instead of my usual overnight soak, and then dunked the locks and vinegar in the dye bath and left it outside for 36 hours. The challenge portion came when I decided today that I was going to tailspin these locks, without further prep. I love spinning from the lock, but I flick or comb the locks before going at it, unless they are super nice and fluffy already. I have done a couple locks "proper" tailspun, as I think of it due to Natalie Redding's terminology, in which I just spin from the mass of locks without any prep, but I have done this only 2-4 times. I did beat the locks before dyeing and after drying to get out as much remaining dust and vegetable matter (VM) as possible, but once that was done I decided, hey, it's Challenge Day, let's do a challenge! So I did. I decided to tailspin the locks, sans prep of any kind, and just let the locks be themselves. Nepps, noily bits, second cuts, clumps, whatever, I let the fiber be itself and got a textured yarn, spun semi-worsted and semi-woolen: occasionally from the fold worsted style, but mostly right from the tail end in a woolen style. The locks are wonderfully soft now, almost too soft, and I am afraid the finished yarn may bleed, so I will finish it in a proper vinegar bath. Since I already have a super textured yarn from this, and not the texture I tend to gravitate too, I will I may just ply it with some silk plying thread and/or metallic threads that came with a scrapbox I bought from Namaste Farms. I do wish I had something like bright blue to put in like thrums in the yarn, but I may get that yet! I love what I'm getting so far. And of course, I am still working on my MKAL. The second clue is out following a slight revamping, in which approximately 120 more beads that first stated will be needed for a more Corinthian-like column. It will be lovely, and it's not too late to hop in! Clue 2 is small to let people catch up, and there is a group for support and sharing progress. 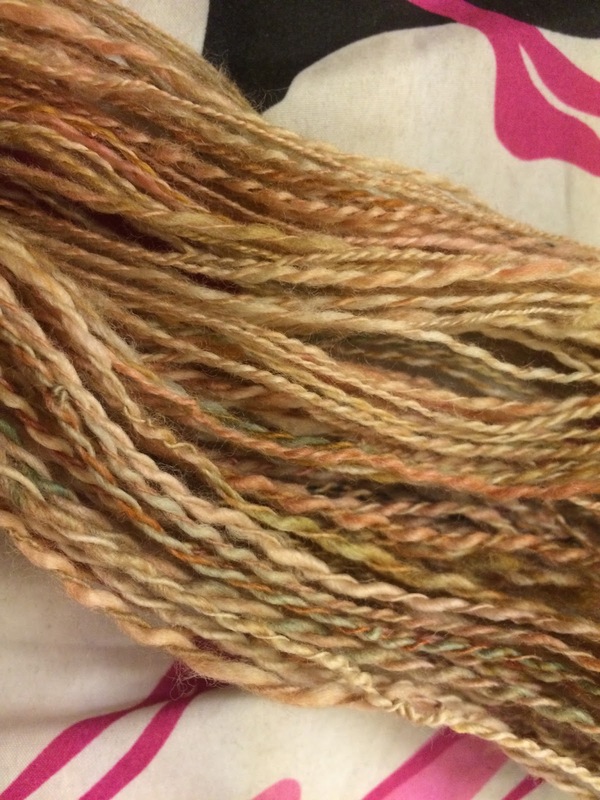 First Dip into Natural Dyes- Lemongrass! I've always wanted to try natural dying, since I first read instructions in the English textbook I had in first grade about how to dye a shirt various colours using different weeds. I've tried the occasional coffee bath on my yarn, but it usually washed out. 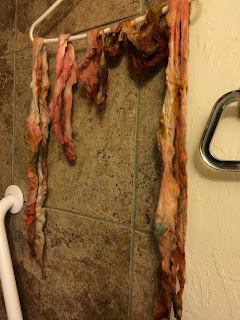 I have since found out that it was because I ought to have let it soak for a while, after looking up countless tutorials and help pages for natural dyers. What strengthened this interest so that I wanted to really do it this time? Why, the beautiful patterns of Caitlin Ffrench, especially her Common Bean shawl. That Common Bean finally made me decide- yes, I am going to try dyeing again, but seriously. So when there was an oversteeped lemongrass tea sitting on my stove, I got out one of my beautiful skeins of naturally coloured Fyberspates Scrumptious Lace and got to work. I followed all the instructions I'd read, but I was impatient. I let it soak in a vinegar/water bath for an hour, then took it out and dunked it right in my wicked brew of lemongrass. 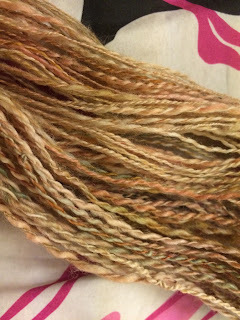 I splashed it a bit with green food colouring and some red right on the yarn so it had a mottled look, and but I now know I did not give it time to penetrate the fibers. I threw some homemade jamaica concentrate into the mix as well, but it also did not soak in, likely due to the fact that I stewed for an hour before removing my yarn from heat, and washed it after another hour. After taking my dyed yarn out of the pot, straining it in the shower (waaaay too messy and smelly for the kitchen sink), I squeezed it until it was just damp and hung it up in the shower to dry. I loved the colour, but it seemed too light and I was afraid it would dry to be an off-white minty colour, which would still have been nice, but not what I wanted. Nonetheless, my yarn took the lemongrass and green food colouring well, and the patchy bits of colour look quite nice to me. Now I know for next time!